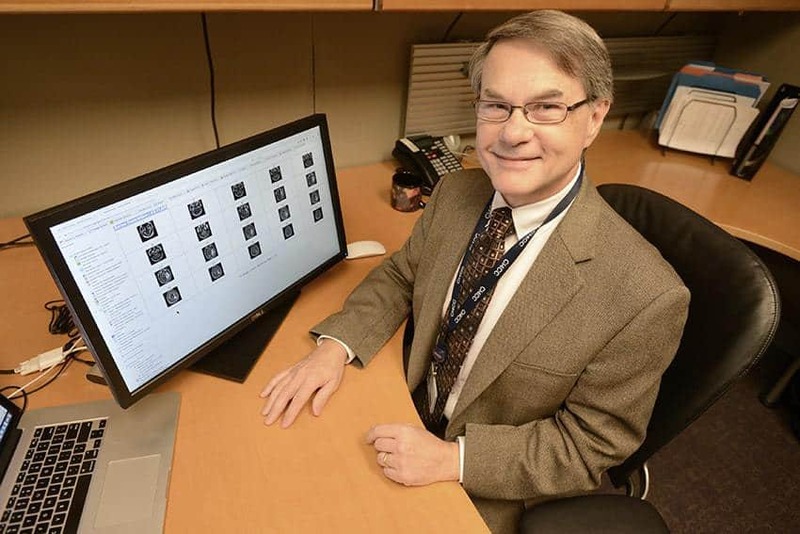 Fred Prior, Ph.D., serves as principal investigator for The Cancer Imaging Archive and recently received an $8.3 million grant from the National Cancer Institute to expand and enhance the online collection of medical images. Oct. 31, 2017 | LITTLE ROCK – The National Cancer Institute (NCI) has awarded an $8.3 million grant to the University of Arkansas for Medical Sciences (UAMS) for expansion and enhancement of an archive containing freely accessible cancer medical images and data. The Cancer Imaging Archive (TCIA) is a free online service that hosts a large collection of cancer-related medical images available for public download. All patient identification has been removed from the images and supporting data, which include outcomes, treatment details, genetic information, pathology reports and expert analyses when available. Since its formation about seven years ago, TCIA data has been used to produce almost 500 academic papers. In 2015, the archive moved from Washington University in St. Louis to UAMS when its lead principal investigator, Fred Prior, Ph.D., took the position as the first-ever chair of the UAMS Department of Biomedical Informatics. Prior assumed leadership of the TCIA project during his tenure at Washington University. Additional principal investigators on the project are Ashish Sharma, Ph.D., of Emory University in Atlanta and Joel Saltz, M.D., Ph.D., of Stony Brook University in Stony Brook, New York. The grant, titled “TCIA Sustainment and Scalability: Platforms for Quantitative Imaging Informatics in Precision Medicine,” supports the TCIA by expanding its capacity to provide data-driven information and images for use in research studies; adding new high-quality data collections; and encouraging the engagement, collaboration and dissemination of information among the research community. “Since 2011, the Cancer Imaging Archive has encouraged and supported cancer-related research by acquiring, curating, hosting and managing collections of images and other data essential to the discovery process. This grant will allow us to undergo the continuous improvements and expansion necessary to provide the large collections of data required to test and validate cancer research studies for years to come,” said Prior, professor in the Department of Bioinformatics in the UAMS College of Medicine. Biomedical informatics uses computers, rather than traditional laboratories, to extract knowledge from large sets of data. Under Prior’s leadership, the UAMS department has grown to include about 50 faculty and staff members responsible for developing computational tools to assess and manage medical and public health information for research programs. The ultimate goal of the archive is the advancement of precision medicine, which allows for therapies to be tailored to the individual needs of each patient based on the specific makeup of his or her cancer. Prior and his team are accomplishing this goal by using computers to read and understand medical images in new ways and by applying these tools across multiple formats, from microscope images of tumor biopsy samples to CT images of the lung. Prior’s research team for this grant includes Lawrence Tarbox, Ph.D.; Mathias Brochhausen, Ph.D.; Tracy Nolan; Kirk E. Smith; William C. Bennett; Roosevelt D. Dobbins; Diana Stockton; and Sean M. Berryman.